Buy the Farm . . . Share: Barramundi!! There's nothing more I love than finding a food I've never heard of before. Today that happened as I came across a fish called Barramundi. Barramundi is apparently "Australia's favorite fish." Funny that I haven't heard any of the Australians I know ever mention this particular sea-dweller. As someone who's spent his entire career working with food it's always a little embarrassing to find something out that is new. Particularly since I'm the go to person for everyone that I know to send a text message at any time of the day to ask me if they're making their pie crust correctly or if I know a better way to sear a flank steak. 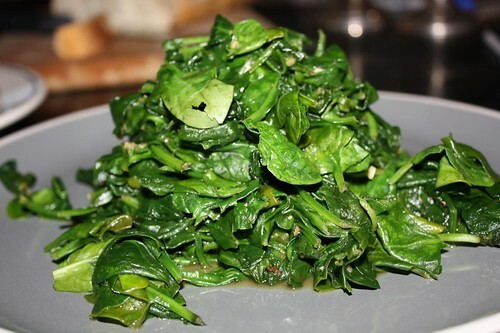 I sauteed a giant plate of spinach with garlic, olive oil, salt, and pepper. I call this "Brooklyn Fish Camp Style" as it closely resembles the style of fresh sauteed spinach they serve at their fantastic restaurant. 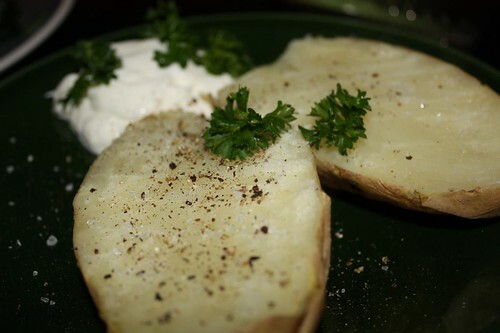 I also made a baked potato with sour cream and parsley. Nothing too fancy. Just a microwaved potato because I was making a baked potato for me and Jen, not for our descendants. Having never cooked barramundi before I wanted to make sure I got a good sense of how it tasted. I marinated it with some lemon and olive oil, cooked it up in a pan and finished it off under the broiler for a minute or so. In the pan I tossed some butter and parsley then drizzled the fish. I must say, the Australians have been keeping a wonderful secret from us all these years. The fish is tender, flaky, and delicious. I really can't imagine a better white fish. And it was quite reasonably priced. Assuming Australia will continue to export this I think I'm going to put this into the dinner rotation effective immediately. 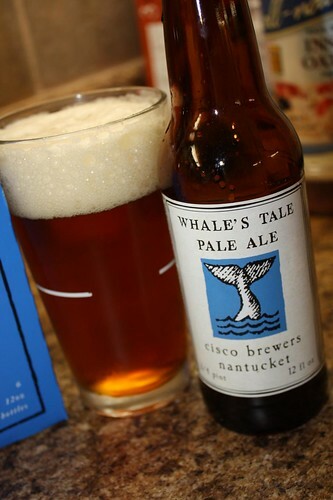 To top it all off I enjoyed a Whale Tail Pale Ale from Cisco Brewers on Nantucket. Much like their Sankaty Light beer I am very impressed with this beer. Not pictured: a repeat of last night's delicious crisp with vanilla ice cream. Also not pictured: the fact that I can no longer fit into any of my pants. I actually had to take some pants to the tailor to be taken out. I guess I've come a long way from when my doctor told me that I had to try to eat as many cookies as possible. I think she'd be singing a different tune these days. OH MAN I wish my doctor would tell me to eat as many cookies as possible. That would be so great. I had a friend whose doctor told him he should just drink huge cups of buttermilk. That actually sounds gross. "Barramundi!" is a lot of fun to say. Sounds like a scandalous telenovela, "Next week on Barramundi! : will Concepcion discover that the man she knows and loves as Adan is really his twin brother Guillermo? Don't miss it!". Also, I was disappointed when you hadn't heard of the garlic mustard plants that I am currently engaged in a years long war with. Brush up on your wildly invasive plants my friend! In that vein, do you have any good burdock root recipes? I'm with Australis Aquaculture, the Massachusetts-based company that has spearheaded the introduction of Barramundi in the US. 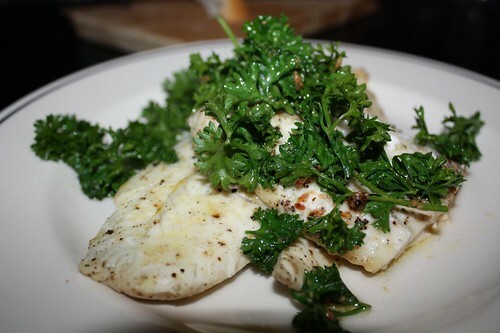 I'm thrilled you've discovered this healthy, sustainable seafood and the way you prepared it looks delicious! Barramundi eat low on the food chain, which is key to sustainability, and they can manufacture omega-3’s (with levels comparable to wild Coho salmon), which gives them such excellent health benefits. As you discovered — it’s mild and delicious, and well suited to a variety of different preparations. If you need some ideas, check out the recipe section of our website – We have a a ton of options there! We’ve been working hard to increase consumer awareness of this delicious, sustainable fish and get consumers to ask for it at their local markets and grocery stores. As a result, availability is becoming more widespread. You can find Australis Barramundi in select Costco, Whole Foods, Safeway (under the Waterfront Bistro label), Kroger, and other fine markets. Did you purchase your Barramundi at one of these stores? I'm curious to know if it was our fish! Thanks for the info, Kelsie! I will be promoting Barramundi to all that are willing to listen. Caolan: Drinking buttermilk does sound absolutely disgusting. Lisa: I've never found anything convincing to do with burdock. The only thing I've often thought about burdock is that it sounds like it's a relative of Goku. I would watch that telenovela. I would not watch that telenovela, but I would seriously mock the people who did. But great thinking on Lisa'a part.